Permaculture design, education and implementation. Who is Tree Frog Permaculture? 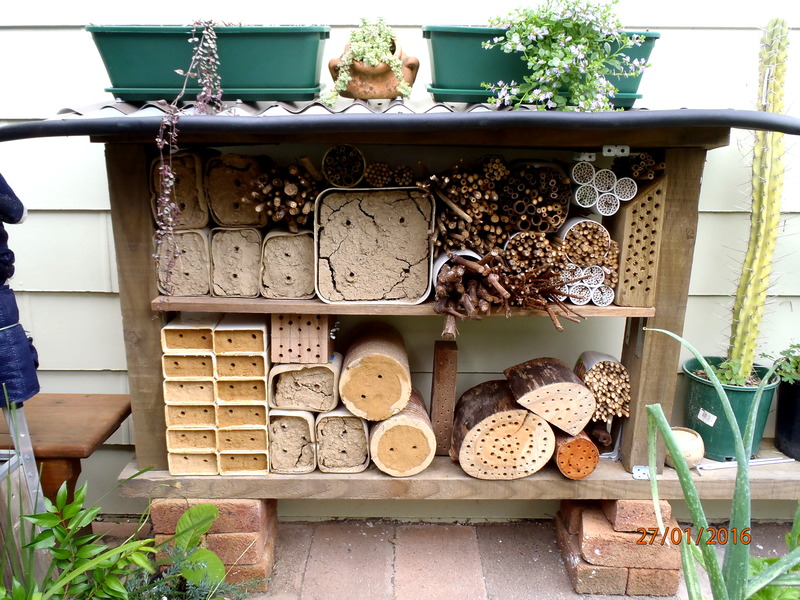 For the love of Aussie Bees – Got’s the BEE FEVER. I’ve always had a healthy respect for bees… in the last few years my respect has broadened and grown to encompass many more bee speciesÂ as i’ve discovered their seemingly less obviousÂ existence (at least to modern white Australia). TheÂ sheer diversity that Australia holds in native bees is of huge wonderment to me and I rarely get quite as excited as when I manage to spot one lured back to the suburbs or out on a bushwalk. More recently, it seems like a dam has broken in my head… I think triggered byÂ the successful division of the originalÂ Stingless bee (Tetragonula carbonaria) box here and/or the acquisition of a couple of new colonies at the end of 2015. 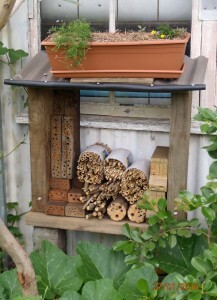 I’d been researching trap nest construction for a couple of years and floodgates wide open, I decided it was time to get serious about my home’s beneficial insect housing options to bolster the more solitary of the native bee species as well as any other happy coincidental residents that felt like moving in. 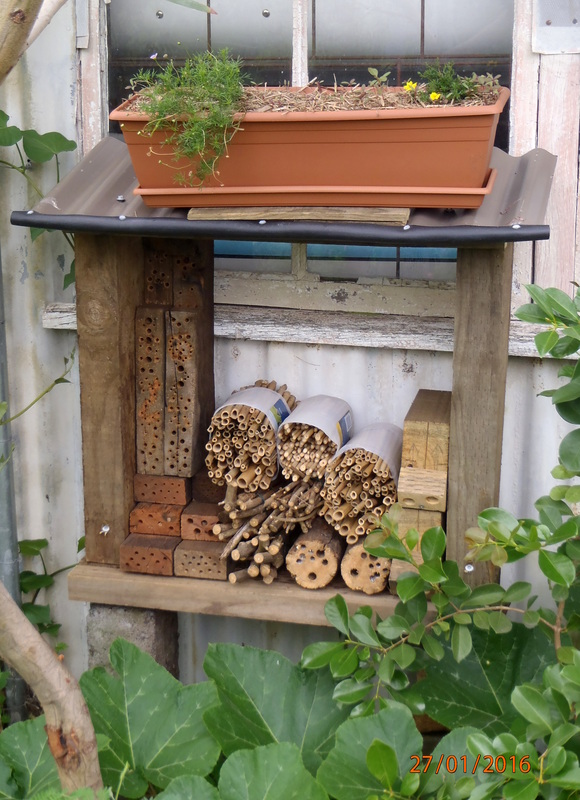 One moderately sized insect hotel wall quickly became two as I feared running out of space for the quantity and variety of nesting material I wanted to try. I’ll talk more in the future about specific types and the species they have attracted but the range briefly includes Mud blocks, Cob blocks, Pithy stem bundles, Hollow stem/Wax paper straw bundles, Drilled hardwood holes down and across grain, same with soft-woods, varying hole sizes from 3-10mm. Some large hole-dwellingÂ wasps will seemingly use up to ~13mm holes. It doesn’t all happen at once but adding the biggest range of nesting materials ensures the greatest diversity of inhabitants. Of coarse, housing is only one side of the coin with these things… you need a good amount and diversity of flowering plantsÂ to provide food and initial attraction to the area. An accessible source of water is needed too, this means pond with floating aquatics to land on, or even just putting a stick or rockÂ in your bird-bath so bees can drink without drowning.